With sincere Christians prayer is continual, because we continually sin; gratitude is perpetual, because everyday, every moment, we receive fresh mercies from God, beside the old mercies, which are numberless. Praise is also perpetual, because we perpetually see the glory of God's works in ourselves and in the world, especially the glory of His infinite love towards us. -St. John of Kronstadt, "My Life in Christ"
"Let the heaven above rejoice today..."
Let the heaven above rejoice today, and let the clouds sprinkle forth gladness, at the utterly paradoxical and great deeds of our God, for behold, the Gate that is beheld in the East, who was born from a barren womb through promise, and offered to be the dwelling-place of God, today enters the Temple, as a spotless offering that is brought forth. Let David rejoice, plucking the lyre, for it is written, they shall be led to the King with the virgins behind her, her companions shall be brought in, within the tent of God, wherein is His mercy seat, to be raised to be the dwelling-place for Him Who was ineffably begotten of the Father before the ages, for the salvation of our souls. -Idiomelon of the Litia for the Entrance of the Theotokos, First Tone, by George of Nikomedia. 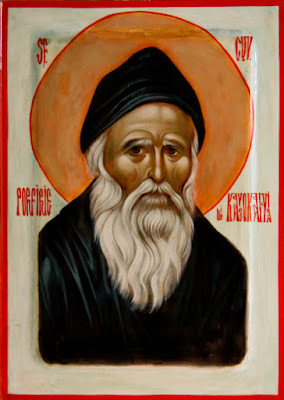 St. Paisios the Athonite: "Give thanks to God for everything..."
Give thanks to God for everything. Try to be manly. Pull yourself together a bit. Do you know what Christians are suffering in other countries? There are such difficulties in Russia! But here many exhibit indifference. There’s not enough disposition to kindness, love of devotion. You see, if we don’t begin to make war against evil, to expose those who tempt believers, then the evil will grow larger. If we throw aside fear then the faithful will be emboldened a bit. And those who wage war against the Church will have a harder time. In the past our nation lived spiritually, so God blessed her, and the saints helped us in miraculous fashion. And we were victorious against our enemies, who always outnumbered us. 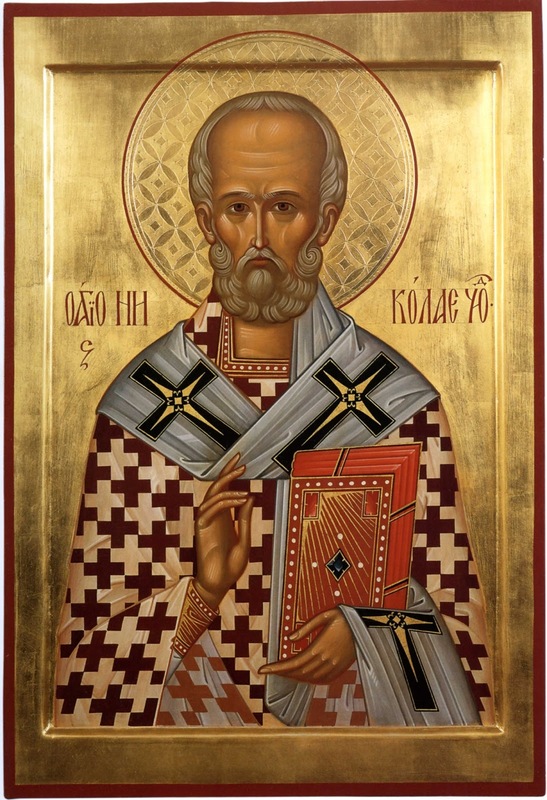 Today we continue to call ourselves Orthodox Christians, but we don’t live Orthodox lives. -St. Gregory Palamas, "Homily 58: On the Saving Nativity of Christ"
As we are beginning the Advent season, I pray that the Lord might make us all worthy to see His nativity in the flesh. May we prepare ourselves to have Him born in the manger of our hearts! Amen! "Let us gather to praise the ever-memorable Menas..."
Let us gather to praise the ever-memorable Menas, the brave servant of Christ, O faithful, with martyrical praises and spiritual odes. For he set to battle invisible enemies, and lawfully struggled, having rightly received the trophy of victory. And now, he dances in the heavens with the indissoluble choir of the Angels, entreating for peace to the world, and the great mercy. -Doxastikon of the Praises in the First Tone, by Anatolios. You were seen as bread, baked by the flames that touched you, offered as a spotless sacrifice, perfect as an offering, and as a spiritual whole-burnt offering, pouring forth divine fragrance, which was smelled by God, O healer of God Menas. -Troparion from the Canon of St. Menas, Ode VIII. "O venerable Arsenios, you were offered to the Lord..."
O venerable Arsenios, you were offered to the Lord, and served Him spotlessly, through your ascetical way of life, for you received the divine fire, which the Savior came to cast upon the earth, for you surpassed the thought of those who dwell on the earth, and became as one outside of the world and the flesh, living the life of an angel. And you became a treasury of divine gifts, and were shown to be a worker of wonders, and a virtuous icon of praxis, in our generation. Therefore, as you partake of the rewards for the pains which you endured, do not cease to intercede, O Father, on behalf of those who celebrate your holy memory with faith and fervor. "O how holy and pleasing to God was your life..."
O how holy and pleasing to God was your life, O God-bearer Nektarios, and O how strange are the wonders which you work daily through your grace! Who would not wonder at you, who are truly worthy of honor? Or who would not glorify you, who was glorified by the Lord? 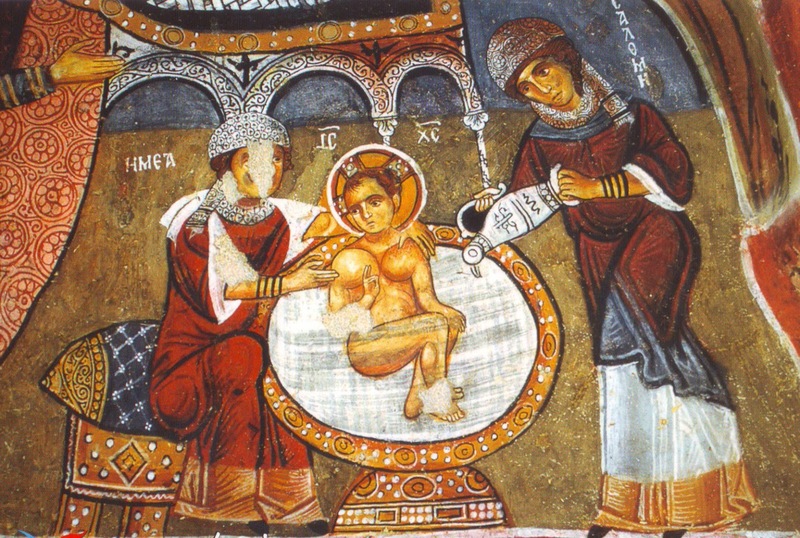 For your divine relics appeared as a spring of healings, curing terrible sicknesses and driving out the unclean spirits, and all who approach them with faith, receive [blessings towards] salvation of souls and healing of bodies, as they glorify Christ, Who wondrously glorified you. "Rejoice with us, all you commanders of the Angels..."
Rejoice with us, all you commanders of the Angels, for your leader and our champion, the great Chief Captain, marvellously appearing today in his sacred shrine, sanctifies it; therefore as is right let us cry out to him with songs of praise: Shelter us in the shelter of your wings, Michael greatest of Archangels! 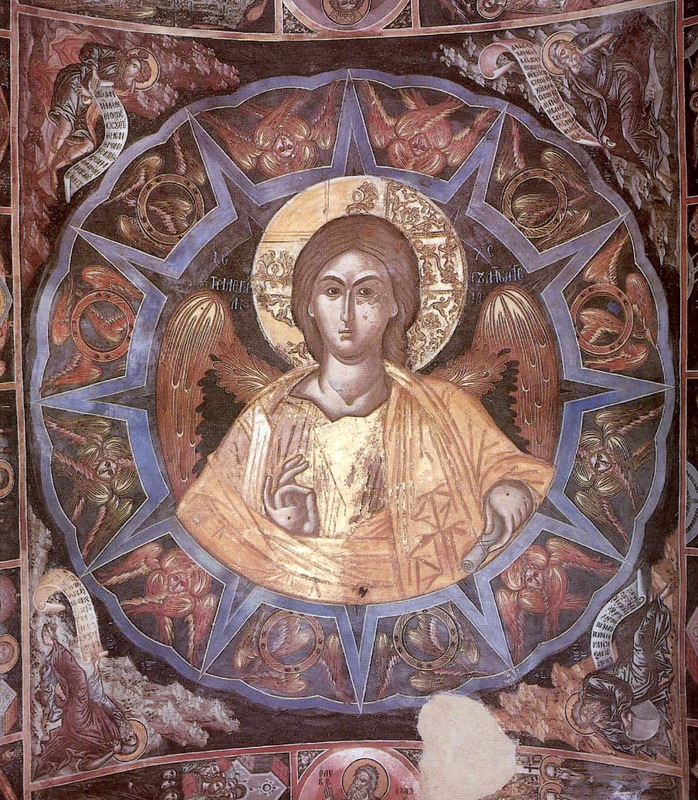 With lips of fire the Cherubim sing your praise, Christ God; with bodiless mouths the choir of Archangels sings a never-ending hymn of glory; Michael, the Chief Captain of the Powers above, offers to your glory an unceasing hymn of victory. For he has shone on us today that for this shining festival we may fittingly ring out in song the thrice-holy hymn with lips of clay; for all things have been filled with your praise, and you grant the world through him your great mercy. For what purpose does the Lord add day after day, year after year, to our existence? In order that we may gradually put away, cast aside, evil from our souls, each one his own, and acquire blessed simplicity; in order that we may become, for instance, gentle as lambs, simple as infants; in order that we may learn not to have the least attachment to earthly things, but like loving, simple children, may cling with all our hearts to God alone, and love Him with all our hearts, all our souls, all our strength, and all our thoughts, and our neighbor as ourselves. Let us hasten, therefore, to pray to the Lord, fervently and tearfully, to grant us simplicity of heart, and let us strive by every means to cast out the evil from our souls - for instance, evil suspiciousness, malevolence, malignity, malice, pride, arrogance, boastfulness, scornfulness, impatience, despondency, despair, irascibility and irritability, fearfulness and faint-heartedness, envy, avarice, gluttony, and satiety; fornication, mental and of the heart, and actual fornication; the love of money, and in general the passion for acquisition; slothfulness, disobedience, and all the dark horde of sins. Lord, without Thee we can do nothing! Bless us Thyself in this work, and give us the victory over our enemies and our passions. So be it! 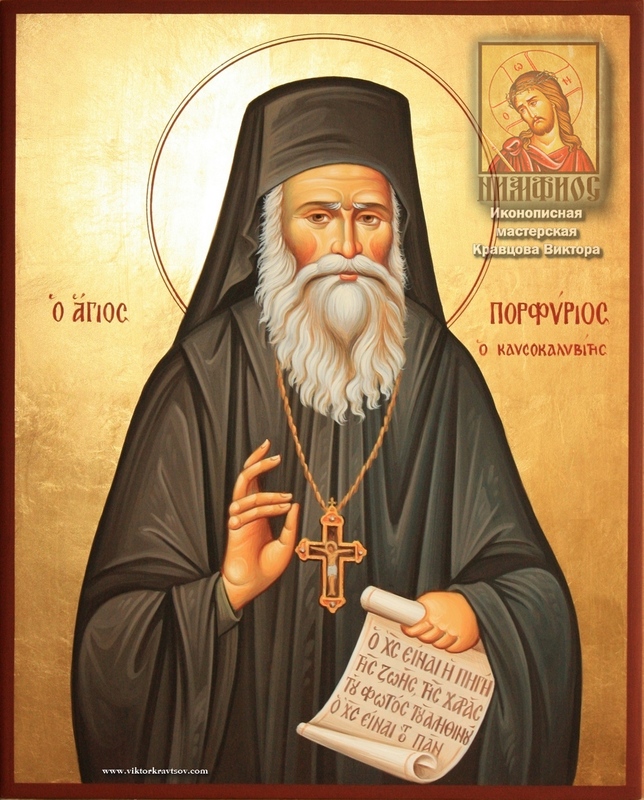 Metropolitan Avgoustinos: "O God of Demetrios, help us!" Today is the feast of St. Demetrios, and thousands of people celebrate. 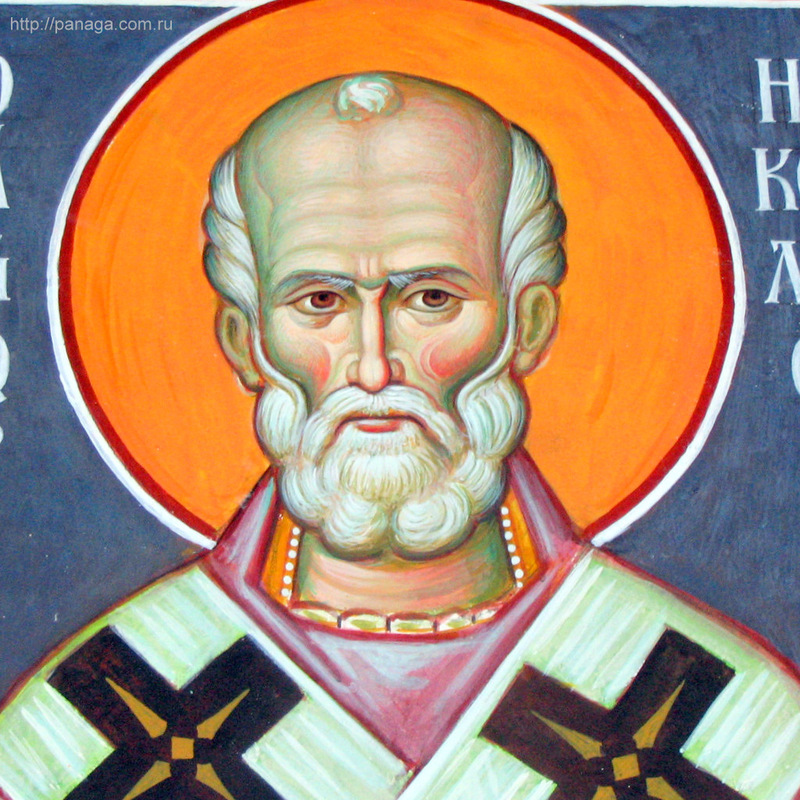 Many villages and cities celebrate, because the name Demetrios is one of the most common and beloved names in the Orthodox Church. St. Demetrios is honored in all places where there is Orthodoxy. If we were to go to Serbia, we would meet the name of St. Demetrios, and in Bulgaria and Romania and even in Russia, the name of St. Demetrios is loved, honored and venerated. 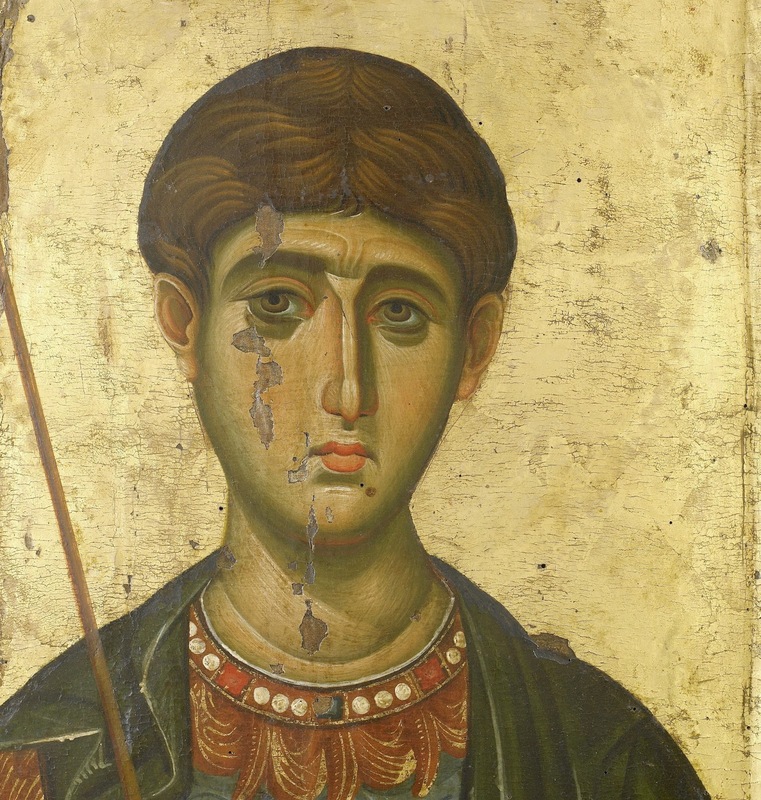 What was St. Demetrios? A monk? Did he get up and leave his house and go into the mountains and crags to live in asceticism? No. What was he? A priest or a bishop? No. He was a layman. He was a soldier. And however, he became holy. What does this mean? That there is no career that hinders one from becoming a Christian and becoming holy. The farmer who works the soil, and the shepherd who keeps sheep, and the artist who directs, and the teacher, and professor, and soldier and general, small and great, all can become holy. We see, in other words, that the Saints come from all careers. 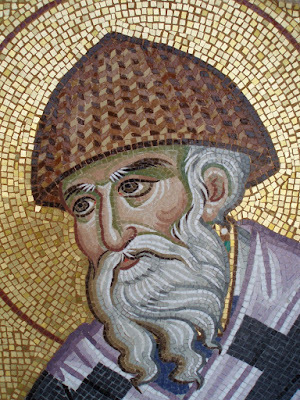 Demetrios was therefore a Saint. But what does “Saint” mean? A Saint means to be a hero. Not in the small and humble way that the world perceives. The world calls a hero him who takes up weapons, ascends into the mountains, and fights and kills. These are the heroes that the world perceives and honors. But above those heroes, who are victorious in battles, there are other heroes, who are a rarer kind of hero. Alexander the Great, who conquered the whole world, complained and said: “I, who conquered the whole world, have been conquered by my passions.” Because of this, our ancient forebearers said that “to conquer one's self, that is the highest victory.” Someone could subjugate the whole world, like Alexander the Great, but still, however, be a slave to his passions. A hero, therefore, is he who conquers his weaknesses, conquers his passions, his evil deeds, the sinful world that resides within his heart. A hero is he who conquers, as the Fathers say, “the world, the flesh and the devil”. This is the higher form of heroism. 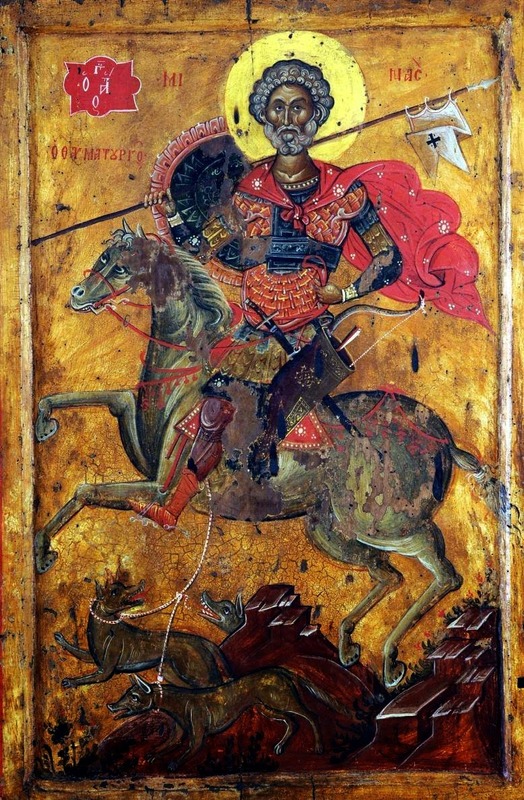 From this perspective, St. Demetrios was a hero. And why was he a Saint? First of all, because he believed in Christ, and he did not hide his faith, he was not a crypto-Christian. Whoever has deep feelings does not hide them, but reveals them, relates them, preaches them. This is what St. Demetrios did. He did not just hide within his heart the name of Christ, but revealed it, preached it everywhere, wherever he went. 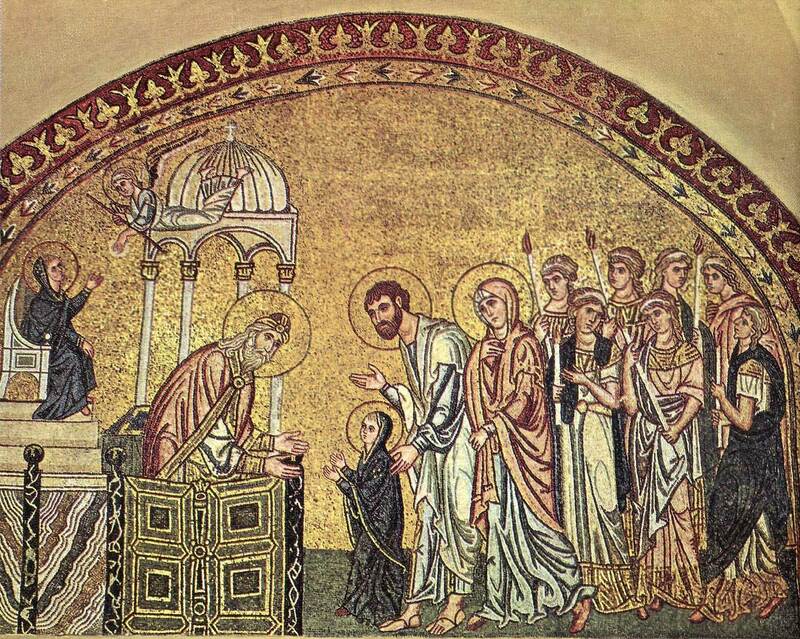 Within the city of Thessaloniki, he tried to make other people Christians. He was not at peace until he made the idolaters Christians. Especially, he showed care to children and young people. He tried to win them over for Christ, and he regularly preached to them about Christ. 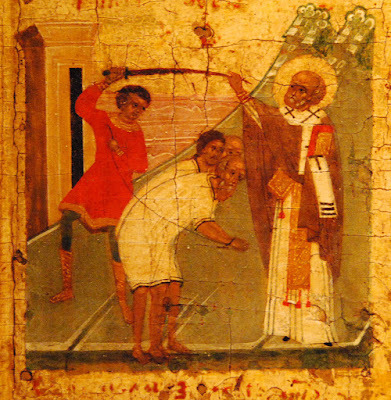 Whereas today a catechist might ring the bell to call the children to Sunday School, something similar we could say was done by St. Demetrios. He was a radiant catechist, a radiant preacher of the truth. Within Thessaloniki, he had gathered children, adolescents and young people, whom he catechized. A special phalax gathered near to St. Demetrios. Besides the soldiers, whom he trained like a general in the barracks, he had another army, a peaceful one, trusting in the name of Christ, and these were the children that he catechized. For this Christian ministry which St. Demetrios undertook, the arms of the idolaters were raised against him. They condemned him, they seized him, they removed his rank, and they threw him in prison. 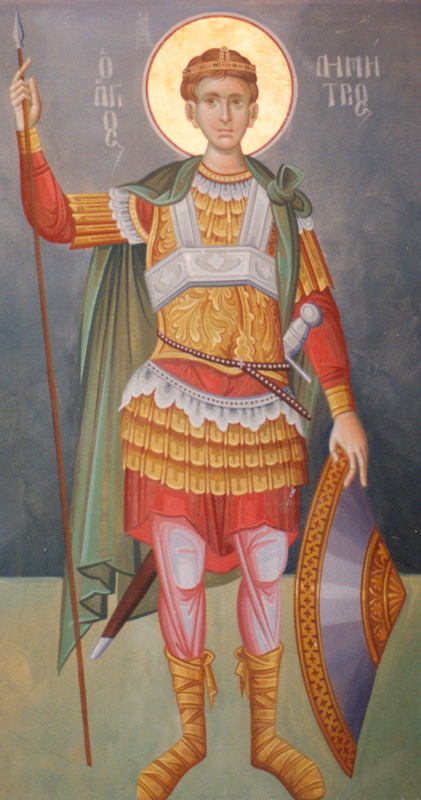 Among those whom St. Demetrios catechized, the brightest, most heroic child was Nestor. In those days, in the great stadium of Thessaloniki, games were occurring. And those games would gather thousands of people to watch them. There were also the kings and rulers and the soldiers. There appeared Lyaios, a huge man, three meters high, a gigantic wrestler. He was a beast, with terrifying power, and he endangered the whole people. He was a barbarian who blasphemed Christ, and no one would dare bother him. Like when a lion escapes from his cage, and everyone begins to tremble and hide out of hear, the same thing happened with Lyaios, who traumatized all of the athletes and no one would dare to go before him. In reality, Nestor went to the stadium and began the fight. When Lyaios saw him, he laughed... 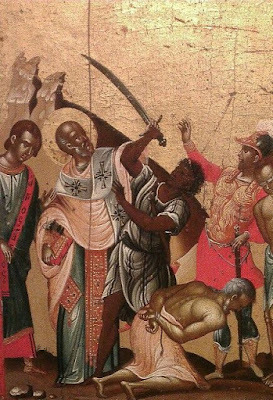 But Nestor, full of boldness, made the sign of the Cross and cried out: “O God of Demetrios, help me.” And like lightning, he fell upon the giant, and threw him down and conquered him. King Maximian became greatly angered at the defeat of Lyaios. He did not want to accept this wondrous result. He ordered them to put Nestor to death. Thus, Nestor was martyred for Christ. 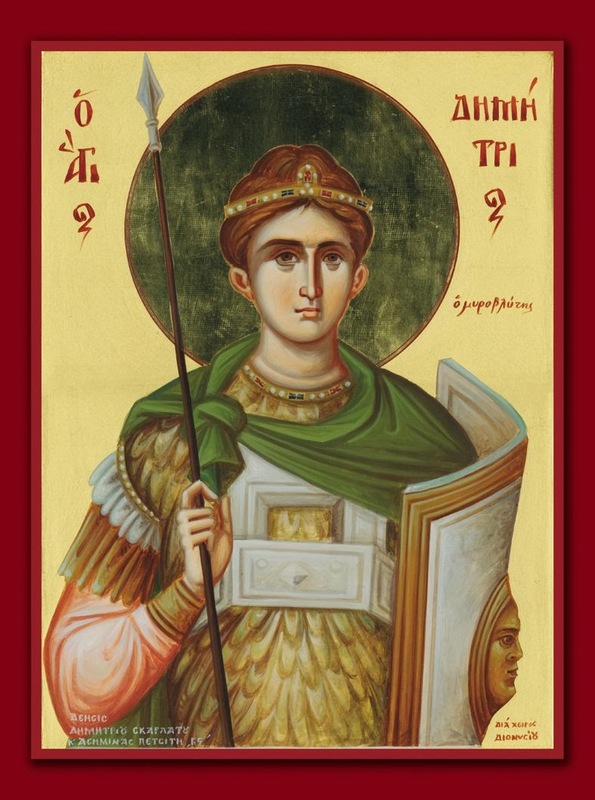 And St. Demetrios? His end was also martyrical. As Nestor was martyred, he was martyred as well. Not only with his mouth, but with his blood. This “I believe...” [i.e. 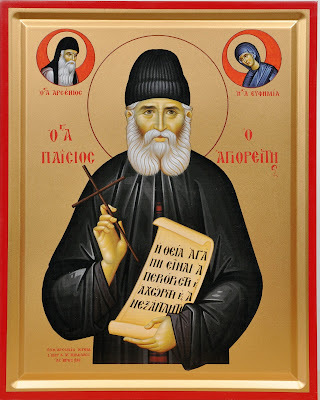 the Creed] which we hear in the Divine Liturgy, is not written with ink and pen. This “I believe...” is, my brethren, written with the blood of the martyrs. This “I believe...” St. Demetrios also signed with his blood. They went to the prison where he was, and the soldiers ran him through with spears, like Christ was pierced in His spotless side, when blood and water poured forth. 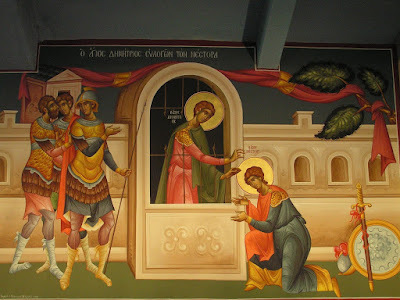 Thus similarly, from the side of St. Demetrios, was poured forth myrrh, eternal myrrh. This in a few words, my beloved, is the life of St. Demetrios, whose name is honored by all of the towns and cities from Dounavi to Crete, from Kerkyra to Cyprus, and from Australia to America and everywhere. A great Saint. 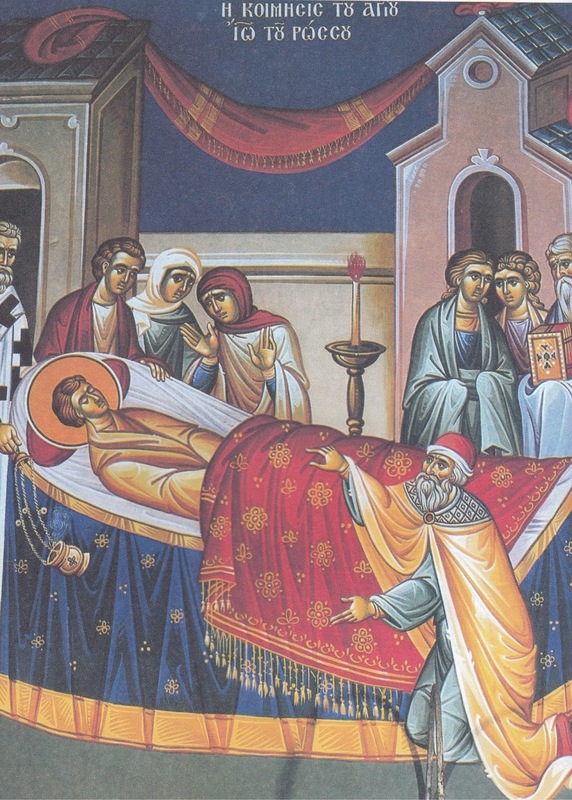 There where they buried St. Demetrios in Thessaloniki—this is not a myth—thousands of people would go to his tomb, men and women, widows and orphans, poor and sick people who had lost hope in physicians and medicines of this world. And all of them became well. 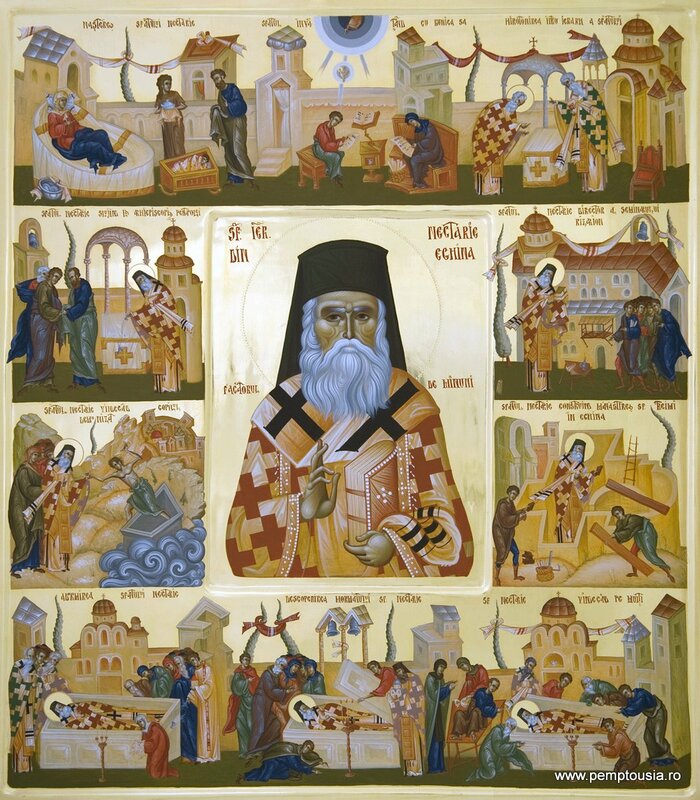 Thousands of miracles occurred and continue to occur through St. Demetrios. And the greatest miracle occurred in our days. How many years passed since then? In his holy church, the Turks had built a mosque. The hodja ascended and said the “allah, allah”. For 500 years the Turks were there. But in 1912, on a holy day when the Saint was being celebrated, the Turks fled, and instead of the crescent moon which they had on the mosque, they raised a blue flag, the sign on the Cross. *Note: Metropolitan Avgoustinos is not at all being racist or implying that every citizen of Turkey is the same. By the term "Turk", he refers to those muslims who worked great oppression and atrocities against Christians for hundreds of years. While we are always called to love and forgive our enemies, God often even in this life, grants us deliverance from our oppressors and the freedom to follow Him. 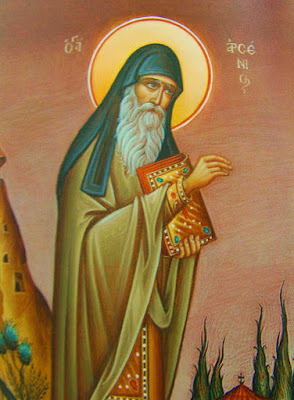 "Ablaze with divine glory and grace..."
Ablaze with divine glory and grace, Martyr and Champion, you shine as though formed of light, and you enlighten those who cry: Blessed are you, Lord, in the temple of your glory. Adorned with your own blood as with royal purple, having the Cross for a sceptre, glorious martyr, you now reign with Christ, crying: Blessed are you, my God and Lord. The multitude beyond understanding of the wonders that Christ granted you freely, glorious Martyr, you display for all; and grace of healings beyond reason that is clearly yours, proclaims grace to us who cry: All you his works, praise the Lord! The Orthodox Church holds its Martyrs in the highest regard. They are those who witnessed to Christ, denied all worldly joys, and suffered manifold tortures in order to gain Christ and His Kingdom. As such, historically, the Church has immediately called them blessed after their martyrdom, and sought their blessings. And the Church has produced many myriads of Martyrs throughout her history, from the first to the 21st centuries. "Therefore everyone who confesses Me before men, I will also confess him before My Father who is in heaven." Please note that this is an amateur translation of the text that is not set to match the meter of the hymns. I request that you review this translation / grammar before public or liturgical use. I also think that it would be best to seek the blessing of your bishop before using this, as these are sensitive issues which require great care, discernment, obedience humility and love. Despite these, the reason that I provide this, however, is to show a small token of thanks to our Lord for strengthening His children among great trials, and to encourage those who continue to suffer for Him throughout the world, until He comes again to judge the living and the dead, to render to each according to his works. The priest says the “Blessed is our God...”, followed by the Psalm “He who dwells in shadow of the Most-high” (Psalm 91). Verse: God is wondrous among His Saints. The God of Israel, He will give strength and protection of His people. Blessed is God. Verse: The Saints that are on His earth, the Lord has shown wondrous, all that He desires is within them. Thy Martyr, O Lord, in his (her) courageous contest for Thee received as the prize the crowns of incorruption and life from Thee, our immortal God. For since he (she) possessed Thy strength, he (she) cast down the tyrants and wholly destroyed the demons’ strengthless presumption. O Christ God, by his (her) prayers, save our souls, since Thou art merciful. 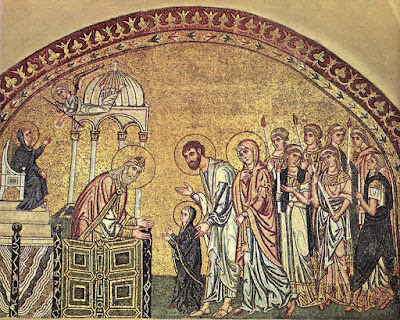 We magnify you, O Theotokos, crying out: You are the mountain, from which unspeakably was cut the stone, that destroyed the gates of Hades. Stasis I. Tone Plagal of the First. The Heirmos. Verse 1. Blessed are those whose ways are blameless, who walk according to the law of the Lord. Let the ranks of the faithful gather together, and offer up a hymn of glory to Christ, the strength of Your Martyr. Verse 2. Blessed are those who keep his statutes and seek him with all their heart. We magnify You, O Christ the Life-giver, Who glorified Your servant amidst struggles against enemies sensible and noetic. Verse 3. With my lips I recount all the laws that come from your mouth. Mourning adorned the Saints formerly, and their deaths with noise and tears, but now, they rejoice and dance on behalf of them. Verse 4. I rejoice in following your statutes as one rejoices in great riches. For those Champions who died on behalf of You, O Savior, death is truly a sleep, and a journey to great rejoicing. Verse 5. I will walk about in freedom, for I have sought out your precepts. We offer up for you, O Champion, funeral hymns, and joy of soul and heart, and we glorify Your struggles in faith. Verse 6. Though rulers sit together and slander me, your servant will meditate on your decrees. You stood before the judgment seats of the lawless manfully, having been arrayed with the Cross of the Lord, O Champion, and you preached Christ. Verse 7. Your statutes are my delight; they are my counselors. You now stand before Christ with fervor as a communicant, through the passion that you suffered, O all praised one, now have joy and gladness with Him. Verse 8. I hold fast to your statutes, Lord; do not let me be put to shame. Now, you rejoice together with the choirs of the Saints, in the all-joyous dwelling places of the heavenly Kingdom, O blessed one. Verse 9. Turn my heart toward your statutes, and not toward selfish gain. The ranks of the Champions, and the multitude of the Saints have received you as an added New Martyr, and an intercessor to Christ for those upon the earth. Verse 10. I will speak of your statutes before kings and will not be put to shame. This fleeting life has ended for you, but you have gained the life to come, and you ever live in Christ. Verse 11. I have considered my ways and have turned my steps to your statutes. Those who serve at your funeral, O glorious Martyr, protect and cover from every temptation, through your prayers to God. Verse 12. The law from your mouth is more precious to me than thousands of pieces of silver and gold. Though earth now covers your body, the unwaning light of your spirit dwells in the mansions of Heaven. O Father, Word and Spirit, Trinity in oneness, have mercy on your supplicants, through the prayers of the new Champion. We bless you, O pure Theotokos, who was proclaimed by the Martyr in his (her) struggles, as the utterly true Birthgiver of God. Stasis II. Tone Plagal of the First. The Heirmos. Verse 1.Your hands made me and formed me; give me understanding to learn your commands. Truly it is right to magnify the new and glorious Martyr in odes and hymns, who died and now lives together with Christ. Verse 2. May those who fear you rejoice when they see me, for I have put my hope in your word. You deposed the enemies, O radiant boast of new Champions, and you raised up the trophies of victory, having gained them through struggling on behalf of Christ. Verse 3. May those who fear you turn to me, those who understand your statutes. O holy one, you have become a glory to the faithful, and a shame and dishonor to the faithless, therefore we piously glorify you with hymns. Verse 4. The arrogant dig pits to trap me, contrary to your law. You now sleep, for the death of Your Saints is sleep, but your eye is untiring, and gazes upon those who hymn you. Verse 5. In your unfailing love preserve my life, that I may obey the statutes of your mouth. 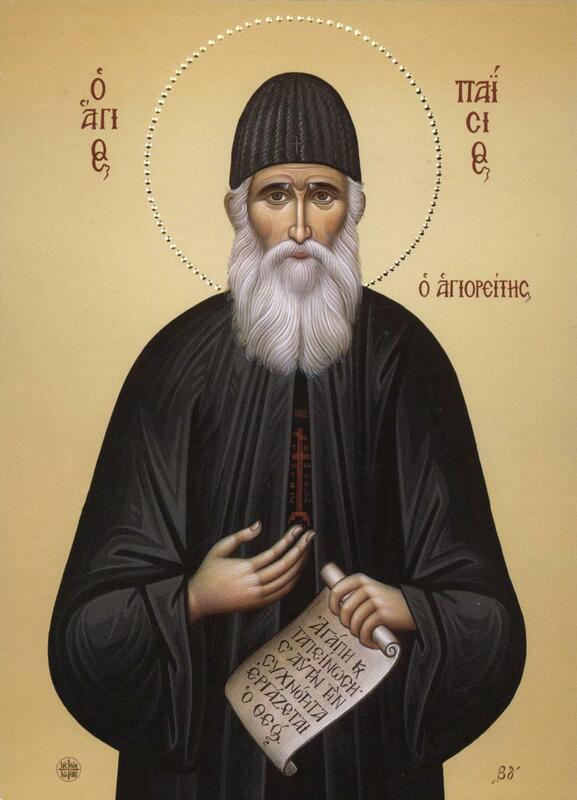 O Martyr of Christ, most-steadfast Champion, do not cease to pray for your servants, who honor your struggle with faith. Verse 6. Save me, for I am yours; I have sought out your precepts. 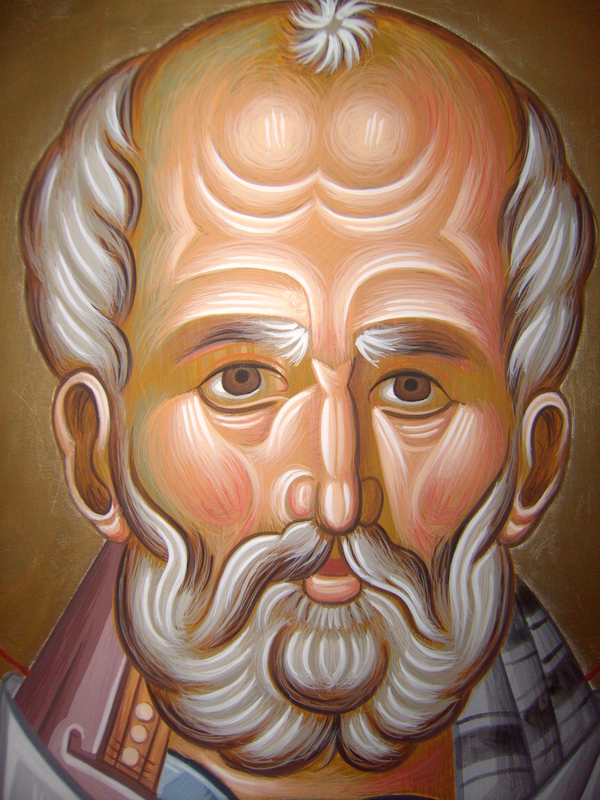 The whole multitude of Martyrs on high has fathered, to bring glory and honor to the brave struggler of Christ. Verse 7. The wicked are waiting to destroy me, but I will ponder your statutes. O Champion, you have been shown forth as a phoenix rising to Paradise, as the Prophet David said, and an evergreen plant. Verse 8. I have more insight than all my teachers, for I meditate on your statutes. All were struck, seeing you victorious before lawless judges, O brave Martyr, and steadfast in mind. Verse 9. I am your servant; give me discernment that I may understand your statutes. 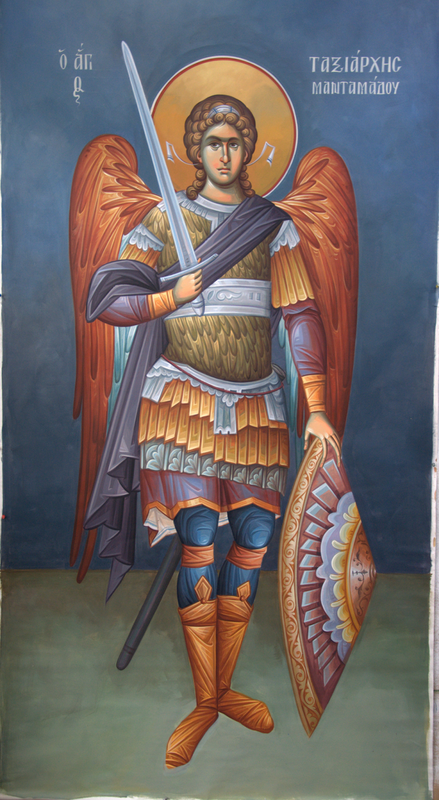 The ranks of mortals and of the Angels rejoices in your struggles, O new Martyr, and they glorify the power of Christ. Verse 10. Your statutes are wonderful; therefore I obey them. Heaven rejoices to receive your spirit, but the earth also rejoices, to receive your sacred body. Verse 11. The unfolding of your words gives light; it gives understanding to the simple. Deliver, through your prayers, those who hasten to your funeral, and grant healing for those who are standing by your divine Relic in faith. Verse 12. I open my mouth and pant, longing for your commands. Entreat God for the remission of our sins, for those who with reverence, are burying you, and covering your body with the earth. O Beginningless God, Father, Word and Divine Spirit, through the intercessions of the Martyr, save all those who believe in You. 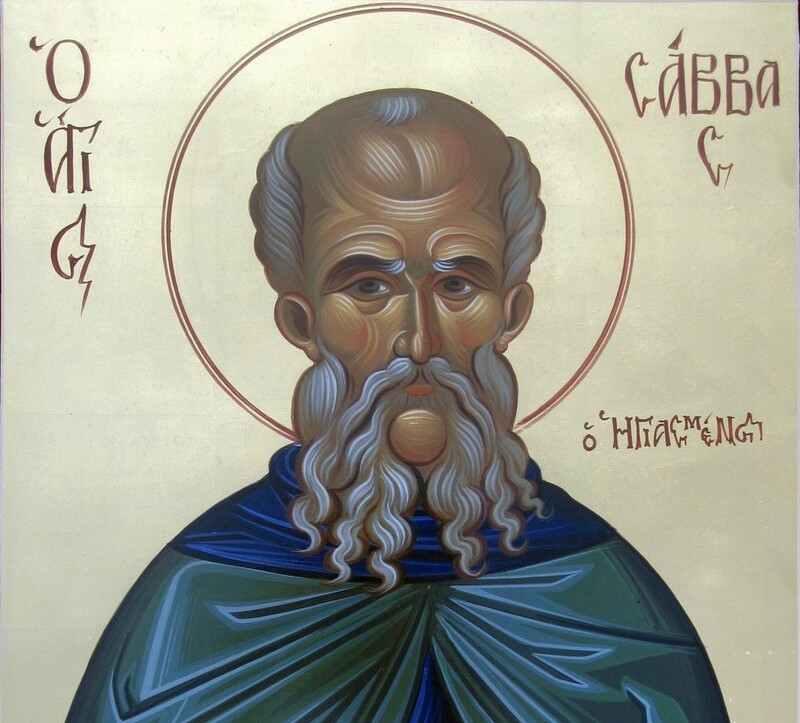 It is truly right to magnify you, the Theotokos, who are more honored than the Cherubim, and more glorious than the Seraphim. Stasis III. Third Tone. The Heirmos. Verse 1. Turn to me and have mercy on me, as you always do to those who love your name. Every generation blesses you, O Champion of the Lord. Verse 2. Direct my footsteps according to your word; let no sin rule over me. You struggled bravely, and rightly received the crown from Christ. Verse 3. Make your face shine on your servant and teach me your decrees. You struggled lawfully, and you finished the race of divine martyrdom. Verse 4. The statutes you have laid down are righteous; they are fully trustworthy. You have kept the faith, you glorified the Creator, through your godly mind, O Martyr. Verse 5. My zeal wears me out, for my enemies ignore your words. Truly, the crown of righteousness is placed upon you, O Champion. Verse 6. Trouble and distress have come upon me, but your commands give me delight. The ranks of the Angels and the choirs of men clap their hands at your struggles. Verse 7. Your statutes are always righteous; give me understanding that I may live. Today, the heavens are opened in glory, that you might enter, O Champion. Verse 8. I call out to you; save me and I will keep your statutes. The divine ranks of the Martyrs come out to meet you, who have died on behalf of Christ. Verse 9. Long ago I learned from your statutes that you established them to last forever. 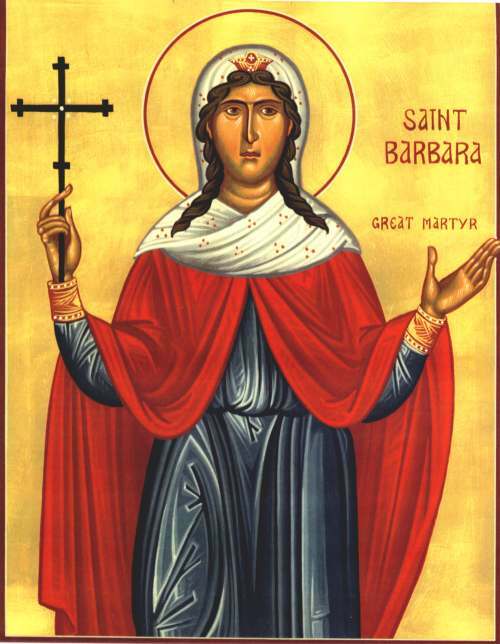 Rejoice unto the ages, together with choirs of the Martyrs, O Martyr and hoplite of Christ. Verse 10. Many are the foes who persecute me, but I have not turned from your statutes. An intercessor and mediator before the God of all, become for those who honor you. Verse 11. I obey your statutes, for I love them greatly. Protect from all dangers, O Martyr, the city that honors you. Verse 12. I obey your precepts and your statutes,for all my ways are known to you. Do not neglect, O Martyr, those who have been made worthy to place you in the earth. O God of all, the Prince of peace, grant peace to the world. O Virgin Theotokos, do not cease to intercede for peace in the world. And the Evlogetaria in the Plagal of the First Tone. The assembly of angels, and all the choirs of the saints, O Champion, now surround your soul in the heavens rejoicing, and they glorify Christ Who granted you strength and crowned you. 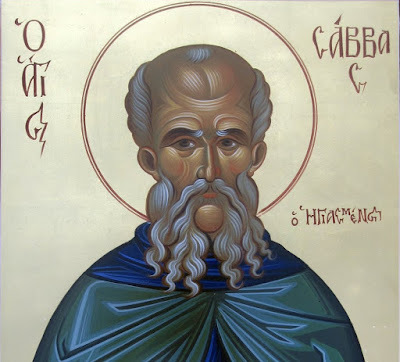 Instead of myrrh, we on earth offer you hymns with fervor, and your sacred body, O Saint, we now bury with reverence, therefore receive our divine fervor, and visit and save us through your prayers. 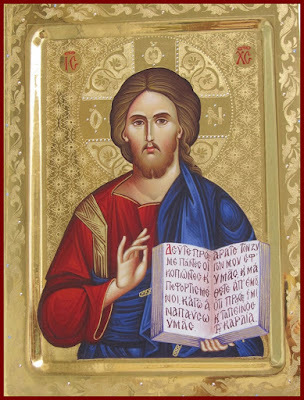 You proclaimed Christ most radiantly as Son of God and God the Word, O Champion, before judges and atheists, and having been slaughtered, received eternal life and live forever. With awe we surround your all-sacred body, and honorably bury it in the earth, invisibly grant divine graces to those who hymn you with faith and fervor. 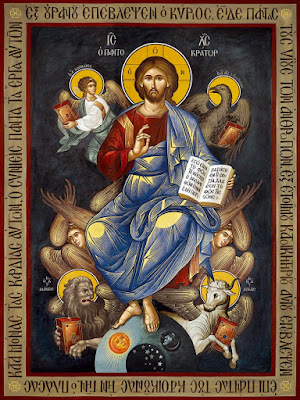 We worship the Father and His Son and the Holy Spirit, the Holy Trinity, for Whom you struggled, O Martyr, manfully, and Who crowned you with incorruptible crowns, O Glorious One. O Virgin you gave birth to the Life-giver and Savior, Who granted salvation to mortals, and Who was preached by the famed Champion with boldness, and most-truthfully you who gave birth to God, and opened incorruption where was formerly death. And the Kathisma. First Tone. Your grave, O Savior. 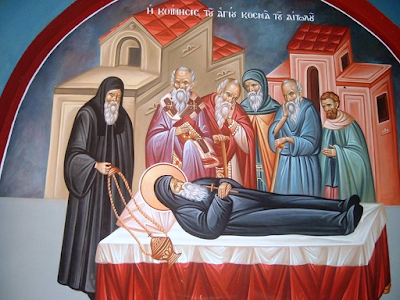 As sacredly we bury your all-holy body, O Martyr of Christ, we entreat with faith and fervor, seeking your grace for your servants, and help and firm protection for those who desire you, and who praise you in reverence, and in all ways do guide them. Then the Prokeimenon: The righteous will flourish like a palm tree, they will grow like a cedar of Lebanon. Verse: Those who are planted in the house of the Lord shall flourish in the courts of our God. The Lord said: Beware of men, for they shall lay their hands on you, and persecute you, delivering you up to the synagogues, and into prisons, being brought before kings and rulers for my name's sake. And it shall turn to you for a testimony. Settle it therefore in your hearts, not to meditate before what ye shall answer: For I will give you a mouth and wisdom, which all your adversaries shall not be able to gainsay nor resist. And ye shall be betrayed both by parents, and brethren, and kinsfolks, and friends; and some of you shall they cause to be put to death. And ye shall be hated of all men for my name's sake. But there shall not an hair of your head perish. In your patience possess ye your souls. Through the intercessions of the Champion, O Merciful One, wash away my many personal offenses. Through the intercessions of the Theotokos, O Merciful One, wash away my many personal offenses. Have mercy on me, O God, according to Your great mercy, and according to the multitude of Your compassion, blot out my transgressions. For those who celebrate the divine burial of your Relic in faith, O Martyr of Christ, entreat that we be granted divine mercy. And then [at the final veneration of the Relic] the following Prosomoia in the Second Tone. When from the tree. 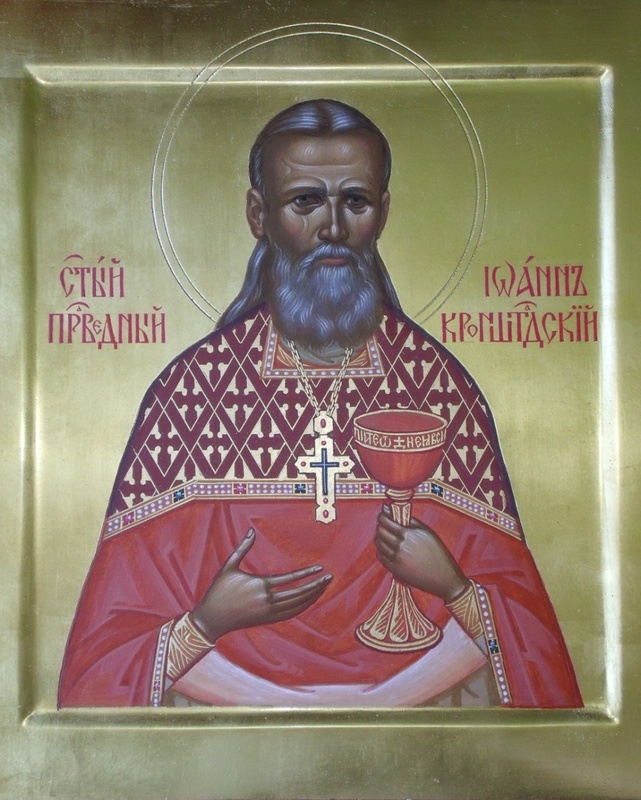 Come, O faithful, let us venerate with reverence and fervor, and embrace the all-holy and surpassingly-precious body of the famed new Martyr, touching it with our lips, our eyes and our foreheads, that we be granted the grace of the Spirit which has been united with it, and let us pray to him (her) in tears, that we might be made worthy of a saving and divine end, through his (her) intercessions to the Lord. Above, the choirs of the Angels, and the ranks of the Champions, rejoices at your holy soul, O blessed one, and exalts together with the multitude of the Venerable, and the choirs of the Prophets and the divine band of Hierarchs, while below, your all-sacred body is honorably buried in the earth, rightly praised in hymns and odes. When Christ comes from heaven with the Angels and Saints to judge everyone, then, your body will be raised again with glory, as it is written, in incorruption, O thrice-blessed one, though it is now buried in the earth in corruption. Therefore, remember all of your servants, that the Judge might have mercy on all, we pray. Your divine body is hidden within the recesses of the earth, but your spirit radiantly was received on high in heaven, O Champion, in the divine mansions and holy dwelling places, where it rejoices together with the choirs of the chosen, until all will be united in the resurrection of the dead, that they might give glory together unto the ages. 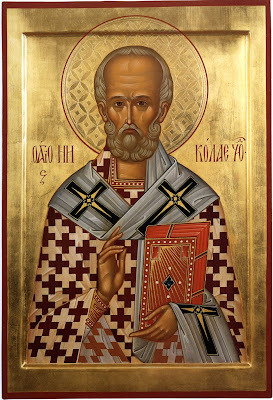 With most-fervent desire and love, O Martyr, deliver those who are burying your divine Relic, through your intercessions, from every sorrow, danger and evil, that in peace, we might celebrate your all-holy memory with annual hymns and the clapping of hands, as we venerate the container of your Relic. 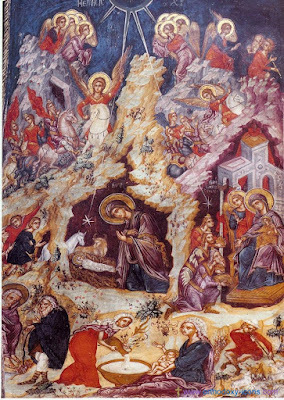 Rejoice, Panagia, the beginning of the human race, O Virgin, from whom Christ the Lord refashioned the nature of mortals. Rejoice, untilled arable land, that bore fruit that is the wheat of life. Rejoice, you who were foreseen by the Prophets. Rejoice, the glory of the Apostles. Rejoice, the strength of the Martyrs.